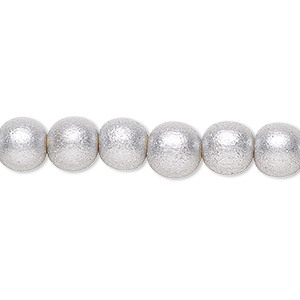 Bead, painted Taiwanese cheesewood (coated), metallic silver, 5-6mm round with 0.5-2mm hole. Sold per pkg of (2) 15-1/2" to 16" strands. Item Number: H20-9437NB Have a question about this item? 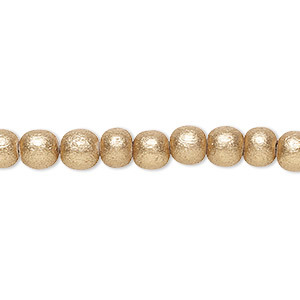 Brighten jewelry creations with metallic-colored round beads. Refined from fast-growing cultivated Taiwanese Cheesewood, each lightweight bead is hand-waxed and non-toxic. Sizes, shapes and colors may vary with handcrafted items. 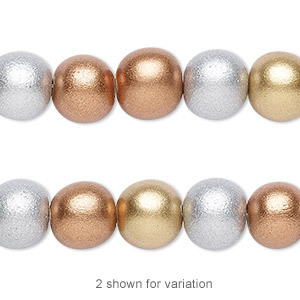 Bead, wood (coated / waxed), metallic gold / silver / copper, 5-6mm round. Sold per pkg of (2) 15-1/2" to 16" strands. 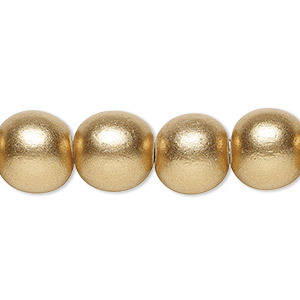 Bead, painted Taiwanese cheesewood (coated), metallic gold, 5-6mm round with 0.5-2mm hole. Sold per pkg of (2) 15-1/2" to 16" strands. 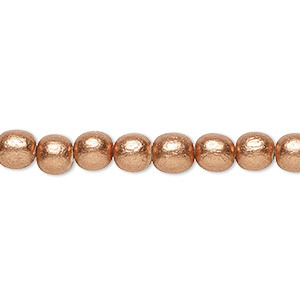 Bead, painted Taiwanese cheesewood (coated), metallic copper, 5-6mm round with 0.5-2mm hole. Sold per pkg of (2) 15" to 16" strands. 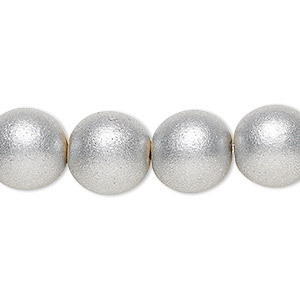 Bead, painted Taiwanese cheesewood (coated), metallic silver, 11-12mm round with 1.5-3mm hole. Sold per pkg of (2) 15-1/2" to 16" strands. 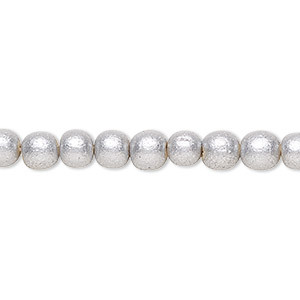 Bead, painted Taiwanese cheesewood (coated), metallic silver, 7-8mm round with 1.5-2mm hole. Sold per pkg of (2) 15-1/2" to 16" strands. 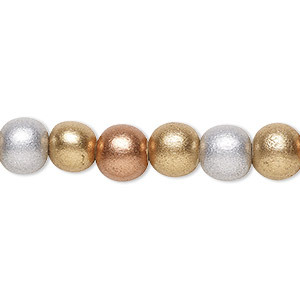 Bead, wood (coated / waxed), metallic gold / silver / copper, 11-12mm round. Sold per pkg of (2) 15-1/2" to 16" strands. 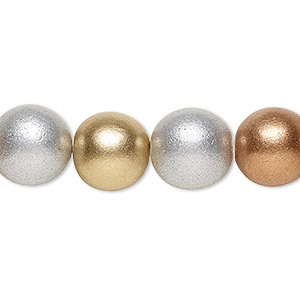 Bead, wood (coated / waxed), metallic gold / silver / copper, 7-8mm round. Sold per pkg of (2) 15-1/2" to 16" strands. 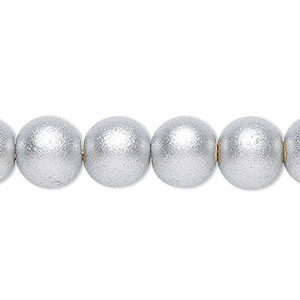 Bead, painted Taiwanese cheesewood (coated), metallic silver, 9-10mm round with 2-2.5mm hole. Sold per pkg of (2) 15-1/2" to 16" strands. 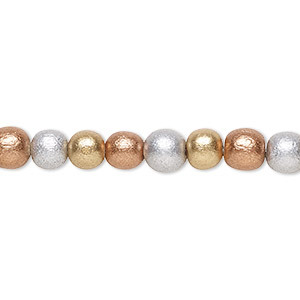 Bead, wood (coated / waxed), metallic gold / silver / copper, 9-10mm round with 2-2.5mm hole. Sold per pkg of (2) 15-1/2" to 16" strands. Bead, painted Taiwanese cheesewood (coated), metallic gold, 11-12mm round with 1.5-3mm hole. Sold per pkg of (2) 15-1/2" to 16" strands.